Image caption You’ve heard of fake handbags being passed off as luxury brands, but an entire store? The internet’s global reach has made stealing brands’ intellectual property even easier, and businesses are losing billions as a result. So what should they be doing to protect themselves? When two new luxury fashion boutiques opened in the Chinese city of Renhuai this summer, it was hard to tell they were fake at first. The storefronts, which appeared to belong to the luxury brands Louis Vuitton and Prada, bore huge photos of models posing with legit-looking products while the shelves were packed with posh handbags and accessories. It was only the misspelled branding that gave the game away. 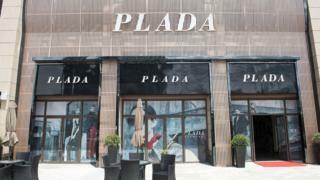 One shop called itself “Loius Vuitton”, the other “Plada”. This is the world of intellectual property (IP) theft, which costs European companies alone about €60bn (£52bn) in lost sales each year, according to figures from the EU’s Intellectual Property Office. In its most recent survey, 7% of EU citizens said they had intentionally bought counterfeit products in the last 12 months. But critics say this black market stifles the development of innovative young companies and costs jobs. “There are also strong links between counterfeiting and organised crime and child labour,” says Alex Newman, an intellectual property expert at law firm Irwin Mitchell. Authorities closed down the fake Louis Vuitton and Prada shops in Renhuai within days, but other big brands operating in China have not been so lucky. In 2016, for instance, Apple lost a trademark fight against a Chinese firm selling handbags and other leather goods using the name IPHONE. China is among a number of countries regularly singled out as a source of IP theft, but businesses say the problem is global. “We have seen copycats for many decades, first starting in the late 1940s and it is a continuous issue we deal with,” says Roar Rude Trangbæk, a spokesman for Lego. The Federation of Small Businesses says 9% of small British firms have had their IP rights infringed on more than one occasion, often by firms operating on UK soil. Typically this involved activities like trademark theft or patent infringement, although copying of products was the most common complaint. Examples include supermarkets producing goods that look just the same as branded ones and even have similar names. In August, for example, family sausage firm Heck and yoghurt maker The Collective both accused Aldi of copying their products. The German discounter says that none of its customers have complained of being misled and it follows “strict copyright guidelines”, but the two firms are still considering taking legal action. Amelia Harvey, co-founder of The Collective, tells the BBC: “Their strategy is clear, they’re taking cues from other brands and recreating; tricking the consumer into buying something that it isn’t. Image caption Is Aldi’s packaging too similar to Heck’s? Mr Newman says supermarkets often get away with it by making “tweaks” so products aren’t identical, “leaving it open for them to argue that the differences are enough to avoid infringement”. Similar problems beset the fashion industry, where allegations of copying are commonplace. In November, UK retailer Next reached a settlement with fashion brand Scamp & Dude over claims it copied the smaller firm’s designs. Next was accused of a “blatant infringement” of an animal print top for children, with the garment even appearing to mimic a distinctive logo. “Often by the time the design rights-holder gets round to doing anything, the accused company will be close to selling through the garments in question,” Mr Newman says. To protect themselves, firms should make sure they have registered trademarks and other forms of IP in any country they operate in. But many still do not bother, says Sonali Parekh, head of policy for the Federation of Small Businesses (FSB). She blames lack of awareness and concern about the costs. “Then there’s concern that if you file for a patent you will alert people to your design and they will tweak it then copy it,” she says. Obvious as it might seem, firms should also tell alleged copyists to stop, although about a third of firms whose IP rights are infringed make no attempt to take action, the FSB says. Mr Newman says this is a mistake. Even if you don’t ultimately sue, a legal letter demanding they cease and desist will often resolve the problem without going to court, and may even lead to a financial settlement, he advises. For those operating in foreign markets, familiarising yourself with local IP laws – which vary significantly from country to country – is vital, although places like China are strengthening enforcement. In November, for instance, Lego won 4.5m yuan (£503,000) in damages from Chinese companies that had sold copycat building sets under the name “Lepin”. At the time the Danish toymaker praised the “the continued efforts of Chinese authorities to protect intellectual property”. “We don’t mind fair competition but unfair competition is bad for the simple reason that consumers are misled and our rights are violated,” says Mr Rude Trangbæk, who hopes such victories will be a warning to potential copyists.